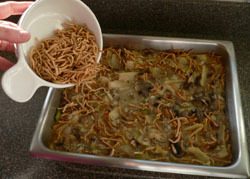 Just 20 minutes to assemble this delicious easy Chow Mein Bake dinner. While it's baking prepare a salad and set the table. Then sit and enjoy a little rest until it has finished baking. A variation from beef you can make Chicken Chow Mein. It's easy to substitute with a couple cups chopped precooked chicken. In a medium sauce pan brown meat, add celery and onion and continue to brown. Add soups rinsing cans of soup with warm water as you add the water. Put meat mixture into a deep 13x9 pan, mix in remaining ingredients. Mix in 1/2 of the chow mein noodles. Bake 1 hour at 300 degrees. Sprinkle the rest of the chow mein noodles on top and bake 15 minutes more.